"My husband is a avid hunter and we make this sausage every year. We add pork to the venison because the venison has such a low fat content. For the pork we get really fatty looking roast ground at our grocery store." In a very large bowl or plastic tub, sprinkle the venison and pork with the curing mixture, pepper, pepper flakes, sugar, and sage. Mix very well to evenly incorporate everything. When working with large quantities of sausage, cook a small piece to make sure the seasoning is exactly how you like it. Divide into 1 pound portions and freeze. This sausage taste great. We couldn't find any of the Tender Quick so we added some bacon to the mix. 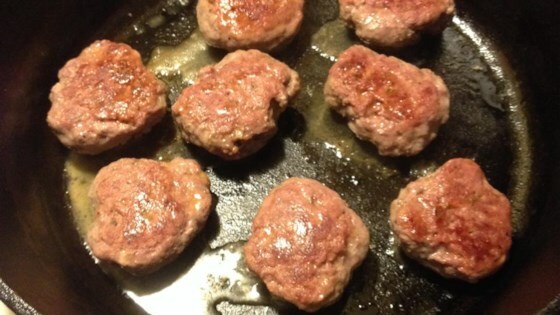 Makes excellent meatballs by adding onion and bread crumbs. This is one of the greatest sausage recipes I have had. We added 1 TBSP of fennel in ours which created a really great flavor. Maybe next time we will add some cummin.